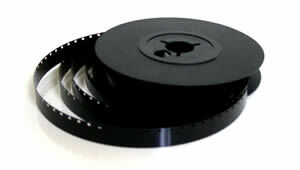 Telecine is the process by which images contained within Super 8 film frames are converted into a digital format for editing in computer software packages. There are a variety of technical approaches to doing this depending upon your budget, your intended output and the visual aesthetic you are looking for. Good telecine makes well shot Super 8 footage look amazing and can make even poorly exposed film look good. A poor telecine job can make imagery look dreadful even though the actual film may be fine. Therefore it is important that you consider carefully your project requirements so that you get the best out of your film. Telecine can be confusing and it is not always the case that the most expensive solution gives the highest quality output. Some people don’t like the look that comes from a professional telecine as it doesn’t fit with their home movie aesthetic, others want image quality to be the best it can, pushing small film technology to the absolute limit. It really is horses for courses! Is your film stock negative or reversal? Do you need standard or high definition output? Do you want your data on tape or hard drive? How quickly do you need the data? For further detailed information on telecine read this Wikipedia article.